What is the effect of anthropogenic O3 on vegetation, and what are the consequences on the terrestrial carbon sink and agriculture? 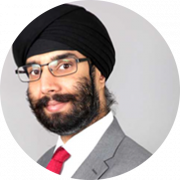 Jasdeep first began his career in Earth Observation Science at Leicester by joining the Air Quality group as a PhD student in 2015. His thesis title was: “Urban Tropospheric NO2 Retrieval Design and Optimisation for the Compact Air Quality Spectrometer, CompAQS”, where he developed new retrieval algorithms to detect anthropogenic NO2 emissions for a proposed compact satellite instrument. Jasdeep trialed these algorithms using spectra measured by the Ozone Monitoring Instrument (OMI; Anand et al, 2015) and from an airborne demonstrator (Lawrence et al, 2015). After submitting his thesis in 2014, he began my first postdoc as part of the EU FP7 Partnership with China on Space Data (PANDA), where his research focus was to infer surface-level pollution from satellite data. Using a mixed effects land use regression model combining OMI tropospheric NO2 columns and in-situ measurements (Anand and Monks, 2017), Jasdeep was able to infer daily NO2 concentration maps over Chinese megacities like Hong Kong. From 2017 onwards he has worked in the Greenhouse Gas group to retrieve and validate CO2 and CH4 columns using spectra from the Greenhouse gases Observing Satellite (GOSAT), as part of the Copernicus Climate Change Service (C3S) project (Buchwitz et al, 2018). He has also worked to verify the prototype CH4 retrieval algorithm proposed for Sentinel-5 as part of the ESA S5L2PP project. Jasdeep’s research interests are urban air quality, atmospheric chemistry, and climate change adaptation. His areas of expertise are retrievals using visible and shortwave infrared spectra. Derive from satellite data the decline in vegetation gross primary productivity (GPP) and crop yield as a function of O3 exposure over chronically polluted regions (e.g. China, USA, Europe) – this will have a much greater spatiotemporal coverage compared to existing estimates based on in-situ fumigation experiments. Anand, J. S. and Monks, P. S.: Estimating daily surface NO2 concentrations from satellite data – a case study over Hong Kong using land use regression models, Atmos. Chem. Phys., 17, 8211-8230, https://doi.org/10.5194/acp-17-8211-2017, 2017.